Welcome to SitcomsOnline Digest! This week, we're hearing about plans for new colorized episodes of classic black and white series to be aired on CBS, news of The Cosby Show returning to national TV for the first time in over a year, and DVDs for a forgotten classic series of the 80s. Let's get going! Olive Films has had a history of giving us some of the "forgotten" series from the 20th Century Fox library, and they will be doing it yet again in January, as they release Hooperman on January 27. In fact, the entire series will be released, with Hooperman - Season One and Hooperman - Season Two coming as two separate releases. Another obscure series was not only announced, but also released this week as a manufacture on demand release: Out of Practice - The Complete Series, on both DVD and Blu-ray. 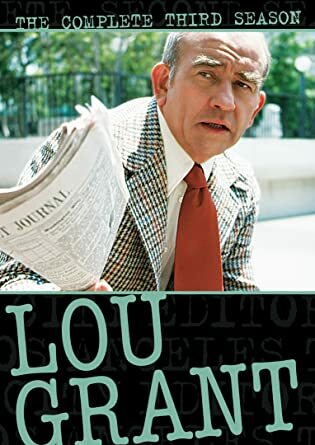 Lou Grant - The Complete Third Season (DVD, $39.97): Shout! Factory brings another season of this spinoff of The Mary Tyler Moore Show to DVD in this release. Who to Follow: Lisa Loring (Twitter), "The Original Wednesday Addams"
Claim to Fame: Thanksgiving may be coming up this week, but before we get there, we're going to (briefly) relive Halloween with Lisa Loring, who was best known for playing the role of Wednesday Addams on the classic TV series The Addams Family. Her first role was on an episode of Dr. Kildare, but shortly thereafter, she landed the role on The Addams Family. Once that series ended, she went on to the short lived Phyllis Diller sitcom The Pruitts of Southampton, which came from the same creator as The Addams Family. Later in life, she appeared in series such as Fantasy Island, Barnaby Jones, and As the World Turns. She took a bit of a hiatus from acting for several years, in part due to some personal life issues, but in recent years she has returned to acting in independent films. And like many child stars of the era, she can frequently be found at events and conventions promoting nostalgic television.